Next up in our series of VB-Inspired Thanksgiving Dishes, we stopped in with Chef Jesse Wykle, of Zoë&apos;s Restaurant, in the Resort Beach, who showed us how to make one of his family&apos;s holiday favorites: Cornbread Dressing with Pleasure House Oysters, Potato and Fontina Cream. 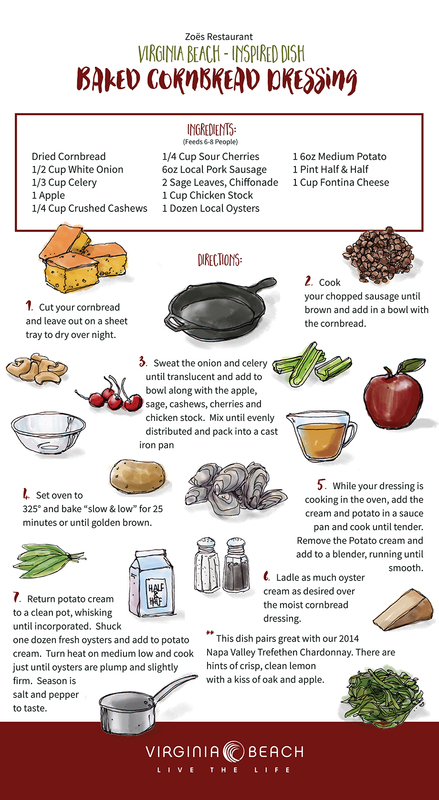 This ridiculously delicious creation is the perfect marriage of Chef Wykle&apos;s deep Southern roots and his coastal culinary style and makes for a unique local take on a holiday sidedish staple. The time is now to start building up that big holiday appetite, because this is one dish for which you&apos;ll want to save plenty of room!